Flooring can be made from many sustainable materials, making it a generally eco-friendly feature in homes and businesses. Flooring can now become a lot more “green” with a cost-effective method that has been developed by University of Wisconsin–Madison materials engineers. This new method allows the engineers to transform footsteps into usable electricity. This new method promotes the beneficial use of wood pulp, a common waste material. The pulp, partially developed from cellulose nanofibers, is already a common component of flooring. When chemically treated, these small fibers generate an electrical charge as they get in touch with untreated nanofibers. Embedding of the nanofibers within flooring enables them to produce electricity that can be harnessed to charge batteries or power lights. Flooring that uses the new technology can be as affordable as standard materials, because wood pulp is considered to be a cost-effective, abundant and renewable waste product of a number of industries. A number of similar materials do exist for harnessing footstep energy, but they are impractical, nonrecyclable and costly at a large scale. Wang’s research focuses on using vibration for generating electricity. For several years, Wang has been testing a wide range of materials as part of an effort to maximize the benefits of a technology known as a triboelectric nanogenerator (TENG). Triboelectricity is the same phenomenon that generates static electricity on clothing. 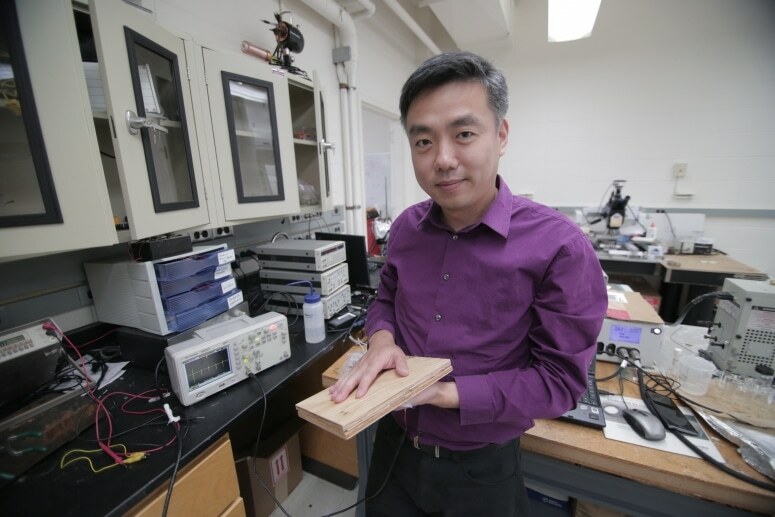 Cellulose nanofibers that are chemically treated are a low-cost, effective and simple alternative for harnessing this largely existing mechanical energy source, Wang says. The new development brought about by the UW–Madison team is the most recent in a green energy research field known as roadside energy harvesting, that could rival solar power in a few situations, and it does not depend on fair weather. Researchers like Wang who work on roadside energy harvesting techniques view the ground as holding immense renewable energy potential that goes well beyond its limited fossil fuel reserves. Roadside energy harvesting requires thinking about the places where there is abundant energy we could be harvesting. We’ve been working a lot on harvesting energy from human activities. One way is to build something to put on people, and another way is to build something that has constant access to people. The ground is the most-used place. Are Wood Burner Stoves Environmentally Friendly? Wang states that increasing amounts of energy can be produced by heavy traffic floors in malls, stadiums and hallways that use this technology. Every single functional portion inside this type of flooring comprises of two differently charged materials, including the cellulose nanofibers, and would be a millimeter or less thick. The floor could have many layers of the functional unit in order to obtain higher energy output. The electron transfer produces a charge imbalance that obviously wants to right itself but when the electrons return, they travel through an external circuit. The energy generated by this process is the end result of TENGs. Wang further states that the TENG technology could be integrated easily into different types of flooring once it is ready to be commercialized. Wang is now working on this technology, and expects to build an educational prototype in a high-profile spot on the UW–Madison campus where he can explain the concept. Wang is already aware that it would be durable and cost-effective. The Wisconsin Alumni Research Foundation holds the patent to this new technology. Other authors on the paper include Zhiyong Cai of the Forest Products Laboratory and UW–Madison graduate students Alberto Hernandez and Yanhao Yu. Funding for the research was received from the Forest Products Laboratory and National Science Foundation.